Welcome to our links page, please click on any of the thumbnail animations,images or links to visit that website. EvergreenConnect is a new concept designed to connect business to business in the green life industry. We offer solutions to all facets of the industry, connecting plant purchasers with suppliers. Our aim is to provide a new marketing channel for nurseries without increasing their workload or expenses and simplifying the process of plant sourcing for end users such as landscapers, landscape architects and retail nurseries. Arcadia Turf and Nursery has plants listed on this website. Plantmark has proudly supplied wholesale plants to the trade for over 25 years. The event was created as a result of so much sadness after the 2011 floods. People wanted to get back into gardening but did not know how. The event helped locals by bringing the knowledge to them with guest speakers, specialist plant sellers and a welcoming smile. From very humble beginnings in 1995 the International Cordyline Society Inc has transformed from being a small group of South East Queensland based Cordyline enthusiasts originally named 'The Cordyline Group'. In 1996 a name change to the Australian Cordyline Society was adopted as the group became more structured in it's format and expanded it's horizons as meetings began in North Queensland. For site Preparation. They can supply a Dingo Digger with bucket levelling bar plus trencher and post bore. 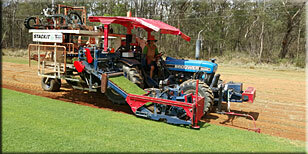 Suppliers of Quality screened Top Soil on the North side of Brisbane. Can deliver direct to any local areas such as North Lakes, Caboolture and North Brisbane. Wholesale Direct Bulk Landscaping Supplies, Delivered direct from the quarry to you. Minimum purchase is 10 cubic meters. Suppliers of high quality screened top soil. Located on the south side of Brisbane, they can deliver to most areas south of and including Brisbane Metro. The Lawn Guide is Australia's original and most comprehensive lawn care website entirely dedicated to every aspect of lawn care. We love lawns! And we know you love your lawn too! The Lawn Care Guide is Australia's favourite lawn care site for independent and unbiased lawn care advice. The Spring Hill "Enviro-Cottage" Project. The objective is to turn one of Brisbane's oldest traditional residential properties into a showcase of sustainable development and environmentally friendly living. TV Show. Hosts Trevor Cochrane and Neville Passmore together with presenters Kim Syrus, Phil Johnson, Matt Leacy and Brooke Stanway share their horticultural knowledge with viewers to make gardening easy and enjoyable. The Garden Gurus website offers additional information on any of the topics seen on the show as well as other features that will keep you entertained and informed. Find out about our TV show, watch segments on-line, join our club, download a fact sheet, browse the guru shop plus a whole lot more.